OCAW has contributed significantly to our country and community during it’s 40 year history. Recognized as a clearinghouse on matters concerning Asian American women, it is considered to be a major minority organization by the White House, the Congress, and other government agencies. 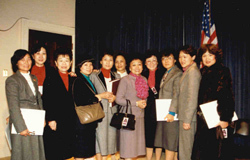 Participated on the Planning Committee for the first White House briefing for Asian Pacific American Women Leaders, May 20, 1985. Held several White House briefings as part of the National OCAW conferences. Built a nation-wide network for Chinese American women and was called a model of networking by the former Director of the Women’s Educational Equity Act Program, US Department of Education. Made visible Chinese American female role-models that encourage future leadership. Designated by the Immigration and Naturalization Service as one of the Qualified Designated Entities to assist illegal aliens to apply for legal status, 1987-88, and enabled many qualified aliens to obtain their Permanent Resident status. Supports congressional bills on women’s economic, educational and health research equity; joined Amicus Curiae Brief in support of American Civil Liberties Union Women’s rights. Inserted OCAW’s position papers in the Congressional Record. OCAW’s issues of concern were included in the Senate Committee on Human Resources Sourcebook, and OCAW’s comments were requested by Federal Departments such as HEW, DOT, etc., on regulations concerning women and minorities. Sponsored a National Asian Pacific American Voter Registration Campaign with 19 other groups to increase voter participation. Co-sponsored a Second Continental Congress of women of the Americas. Developed various women’s career training models. Using these models, it has trained and placed over 1,000 young people, new immigrants, non-professional and professional Asian Pacific American women in new careers and businesses. Conducted series of classes for developing marketable skills to enable career advancement for the non-professional women. Co-established English classes for new immigrants in D.C. Chinatown. Provided assistance to women shelters, food banks, and participated in health fairs. Supports the publication of a bilingual Chinese/English health manuals. Initiated the Arts and Opera in the City Program for disadvantaged youth and seniors. 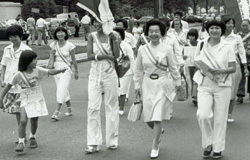 Conducts biennial national training conferences since 1979, with accomplished Chinese American women as speakers and role models, including Ambassador Block and Secretary of Labor Elaine Chao. The 20th Anniversary Training Conference was held at the prestigious US Rayburn House Office Building preceded by a White House tour. 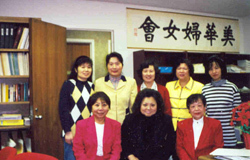 Provides resources to support welfare of Chinese American women. Co-sponsored an award-winning domestic violence conference in conjunction with Prince Georges Community College. Publishes quarterly newsletters to promote member networking, and to inform members of matters relevant to their interests and well beings. Provided 6 annual scholarships for Presidential Classroom to high school junior and senior students. Contributes to the awards to annual International Young Artist Piano Competition. Serves as a member on the Gates Millennium Scholarship Fund Advisory Committee for minority students. Presents annual Award Banquet and Salute to Mothers in May each year. As a special honor to OCAW, the 2001 celebration was held at the U.S. National Archives and Records Administration. The program for this function is now in the United States Archives. Conducted five premier concerts for OCAW /Li Foundation Music Fellowship recipients at Kennedy Center. Many recipients move on to become internationally renowned. Established Opera International to provide an opportunity for young Asian artists, especially recipients of the OCAW/Li Foundation Music Fellowship, to perform lead roles alongside established singers. Produced 9 annual world class operas at the G.W. University Lisner Auditorium in Washington, D.C.. Many world-class young artists from China, Taiwan and Hong Kong have been presented through this effort. This annual event has become an affordable “Opera of the City” in our community. Actively involved in community senior citizen programs. Conducted a Survey of Needs for Low-Income Elderly Housing in 1993. 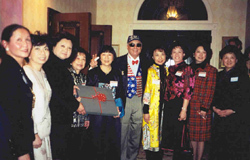 This report culminated into the beginning of the Chinese American Retirement Enterprises project in Greater Washington D.C.
Raised funds for disaster relief, including 9/11 America’s Fund for the families of the firefighters, police and rescue workers. Conducted essay contests to assist high school female students to Overcome the barriers to math and science fields. 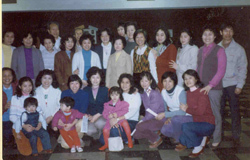 Launched OCAW’s first Women-to-Women Exchange Program on the initiative of a delegation of 20 women to strengthen educational, cultural, and economic linkages with women organizations and leaders in Taiwan, China, and Hong Kong, August, 1987. Raised money for Taiwan Earthquake Relief Fund in 2000. Is a Member of National Council of Women’s Organizations which is a bipartisan network of leadership from over 100 organizations representing more than six million women. Provides Woman-to-Woman programs (National and international outreach to women). Sponsors, advocates, and supports coalition efforts to monitor legislation and policies affecting women and Asian Pacific Americans. Provides outstanding, expert speakers in various fields. Headquarters serves as OCAW Learning and Resource Center.